You don't have to like football to enjoy tailgating! What is more fun than sharing good food with good friends? 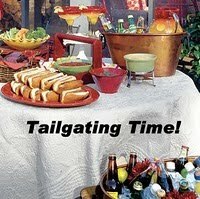 Join us for week #10 of Tailgating Time! Won't you join us? Come on! it's easy, just add your link! It's all about the food, and sharing it with others!! Tucker is ready to go...he doesn't care where just as long as he can ride in the car! It has been perfect weather for tailgating around here. If we want to see the Tampa Bay Buccaneers play we will have to go to the stadium...the game is blacked out for us. It is so unusual to see such clear blue skies in Florida...not a cloud in the sky, we always have clouds. It's been like this for days. If we leave early we can miss the crowd. All sorts of activities...why should the Gulf stop him from driving his truck? If it gets too busy we can always enjoy our tailgating poolside and come back for sunset. Sundays and Mondays we get a chance to do this because Wade isn't working, and it now sets at 6:00PM. There is still plenty to watch when we walk the beach at twilight. Even this couple enjoying the beautiful surroundings....err....while texting. They were both texting when I was focusing for the shot and he moved the last second to say something to her...hehe...well at least they were talking...sorta! Martha is unable to host this week. We wish her and her family well, so she can come back and join us again soon! Tamy I am so sorry. I had it all set to post with the first linky you sent me and I went out on the boat all day and just got back. I also discovered that I had it scheduled for the 15th to post...duh! Some host I am! What great pictures! I would much rather be at the beach than inside watching our Dallas Cowboys actually win a game (the 2nd out of 8 so far)...I love love love the beach and wish we lived closer to one. And trucks work just fine in sand and surf. My oldest girls would be playing with their Barbies in the ocean while my youngest girl would love a truck. Lyndsey, I so enjoyed your pics. I was laughing at that couple texting. What else would they be doing, lol! It's funny, you were at the beach and I was sitting in front of the fireplace. Ha! Thanks for hosting my friend, I hope you have a great week! Tucker is gorgeous! What kind of dog is he? Rhondi - thanks, my sister and I were like that too. My daughter would bring her Barbies. Brenda - Thanks, it's always a pleasure to have you visit. It was funny to see them texting during a beautiful sunset. TPP - thank you, Tucker is our 14 1/2 year old Australian Shepherd. Ah! These pics are so enticing! Made me feel like I should pack up and move to Florida; funny about the couple texting! they were probably texting each other about where they should eat lunch. You do take some really great photos, how nice to be able to enjoy the beach! Oh it is tailgating time again...what a spread! You are so lucky to be able to still go to the beach! Love the pics! Thanks for hosting! Lyndz, I enjoy the photos! Yes, what a lovely day. I can see Tucker is expecting the ride sooner. (why you guys still standing there with the camera! Let's go, let's go!) haha.... It's raining here since last night. Gosh, I think you must be extremely busy for the past few days. Don't even have time to write in a recipe! Hope you're having a great day ahead, honey. Take care. What lovely photos of the beach. It has been gorgeous weather in Florida the last week hasn't it? We always thought late October and November were the best weather months when we lived in the Bahamas. It had started to cool off and the tourists hadn't returned yet, so we had the place to ourselves. Looks like Florida is the same. tasteofbeirut - Ha! You're probably right! Conversations just aren't they same as they used to be! Jeannie - thanks so much! We really enjoy the beach, I just hope I don't bore too many with it. 3 hungry tummies - Yes it's Tailgating time again! Every Sunday we have all these goodies to look at. Marguerite - wish you could visit, we do enjoy the beach!! I am so bad...I didn't even post a recipe. I have plenty to post but it's the writing everything down that gets me. Busy and too tired, I guess I'm getting old...hehe! Sam - This time of year is our favorite for Florida weather and taking advantage of the beaches and outdoor restaurants while we can. Before too long we wont beable to get into either! More time on our lani or poolside too! Our driest consecutive months. How lucky to live so close to the beach! I would be enjoying it every chance I got. I am laughing over the Booger pie link! Reeni, Ha! I laughed over that one too! And Debbi seems like such a nice girl too...lol!